Cover bottom of pan with foil and put it inside 1st white cream and over it a 2nd black cream. When finished on top add biscuit immersed in milk. Leave it in the fridge to spend the night (or wait a few hours to be tightened) and flip it on plate. Than you can decorate it as you wish. 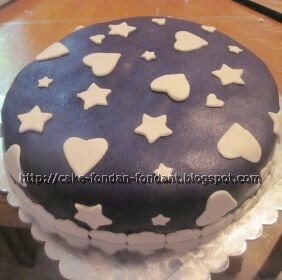 Decoration of this cake is done with white fondant which is colored to navy color. When cake is finished – tightened enough in fridge we are ready to decorate it. 1st Whisk butter and icing sugar – and we’ll get cream with purpose to overlaid complete cake. Cover any unevenness with very thin layer. If some not finished and noticed that time is passing by - cake is worming up. Than we'll put it in fridge again, continue again when it is cold enough. Repeat this procedure until you get the perfect flat surface. Knead fondant to until it becomes soft. 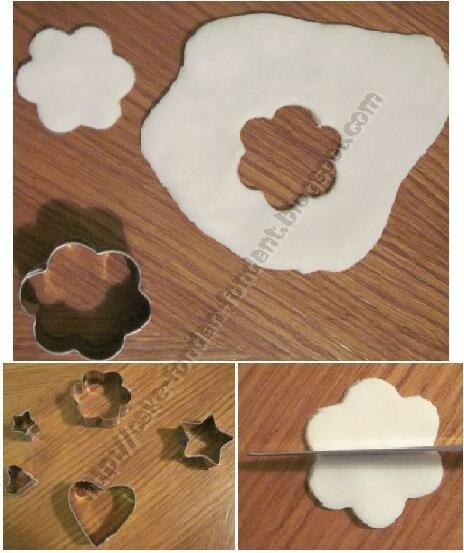 Split fondant on 2 peaces in order to make 2 colors. Every peace take with clean hands and add color till become color that was planed. Poa Popaja. Simple theme. Powered by Blogger.